Bone meal is derived from ground animal bones and slaughter house waste products and is not only used as an organic fertilizer but also as a nutritional supplement for animals. Most bone meal products are certified for use in organic production. Most prepackaged meal used for fertilizer has been heat treated with steam. It is a good source of organic phosphorous and also an excellent source of calcium with an N-P-K ratio of somewhere between 1-13-0 to 4-12-0. Some research has indicated that good plant utilization of the phosphorus is tied to soil pH being below 7.0 so it is important to know your gardens needs by soil testing before adding fertilizer, especially one with a single high nutrient content. The rate at which the meal releases its nutrients depends on the process it goes through. 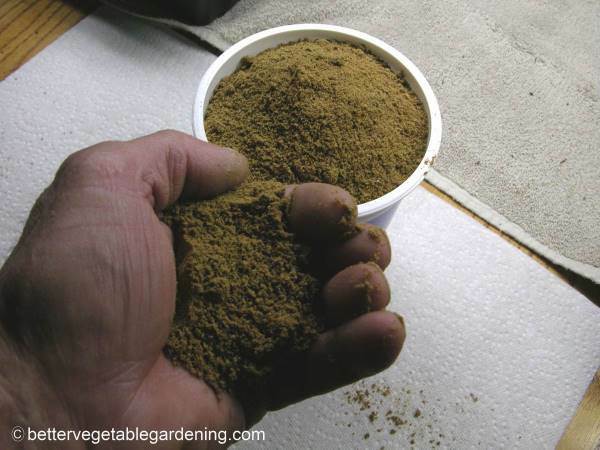 A finely ground, powdered bone meal, that is water soluble has a fast rate of nutrient release. While a coarser ground meal has a medium to slow release rate. However, as with all organic fertilizers, there are several factors that will determine the rate of nutrient release. Apart from the soil ph level, factors that effect this in the garden are, moisture levels, soil temperature and the presents of enough organic matter to support sufficient soil bacteria and micro-organisms to break it down into plant usable nutrients. Other good source of organic phosphorous, for fertilizer include Guano fertilizer and Colloidal phosphate also known as soft rock phosphate.